Be a Part of Change and Help Ensure Every Child’s Right to an Education. Apply here for an overseas volunteer placement with one of our children's, community, school and health education projects. CHAB specializes in saving vulnerable children, ensuring that your help goes where it is needed most, and that our volunteers are always part of a long term solution. 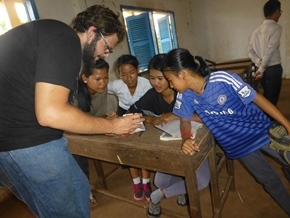 CHAB volunteers improve the lives of local children in local village in Siem Reap, Cambodia, inform of perspectives of Europeans and North Americans, and turn a life-defining experience into a lifetime of opportunity. The most significant accomplishment will be the contribution you make to improve the lives of others. Apply to Volunteer with CHAB Today? Volunteers are not required to pay CHAB to volunteer with us. But... we can’t pay you either. 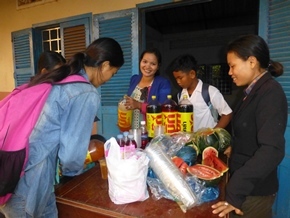 Our resources are reserved for the children, programs and community projects we run. For this reason we are unable to provide housing, payment or stipends for volunteers. Volunteers are required to provide their own flights, visas, and accommodation and living expenses. If you’d like to apply for any of our advertised roles, send out the form below and attached a recent CV. Our team will review your application and be in touch. For Corporate or Group Volunteers, please email us directly, providing as much information as you can. Please also get in touch if you would like to become a grassroots fundraiser or are keen to assist one of our fundraising. If you lived in North America or Australia and so on, you can be a representative fundraiser of North America or Australia. You make a representative office of CHAB in your country. We’re always looking for passionate and driven people to make a difference and share CHAB’s story.